The Crux & Co - like audrey. I feel like there are a lot more people who know about the cafe opposite this place than this actual cafe itself. Inside this cafe is an undeniably impressive contemporary and minimal interior. There’s ample amounts of seating available to cater reasonably well for their busier hours, and they have a mix of shared and individual tables. We rocked up at around 10am and were seated straight away. A waiter was quick to attend to us and take our order. Looking at the menu, I noticed that they have a good mix of options for those with a sweet tooth and those who are on a bit of a health kick. We didn’t have to wait long for our drinks to come out and the food arrived probably about 15 minutes after. I could see a fair few things on the menu that I wanted to try and to me, that already indicates a good start as it means that there’s a chance I’ll be tempted to make another visit in the future. I decided to go for the oatmeal with almond milk. Unfortunately they charged me an extra dollar for it to make it dairy free 🙁 I usually don’t go for oatmeal because the last few times where I did order it from other places, I found it quite bland and uninteresting. However, I really enjoyed the oatmeal at the Crux & Co. It was presented beautifully and it had the right amount of rhubarb to give it enough flavour without being too over-the-top. When I first saw it, my initial thought was that it was a very generous portion but it ended up being a good amount. The coffee was decent – not burnt and not too weak. One thing to note about this place is that they don’t do split bill so bear that in mind if you are going in a larger group. 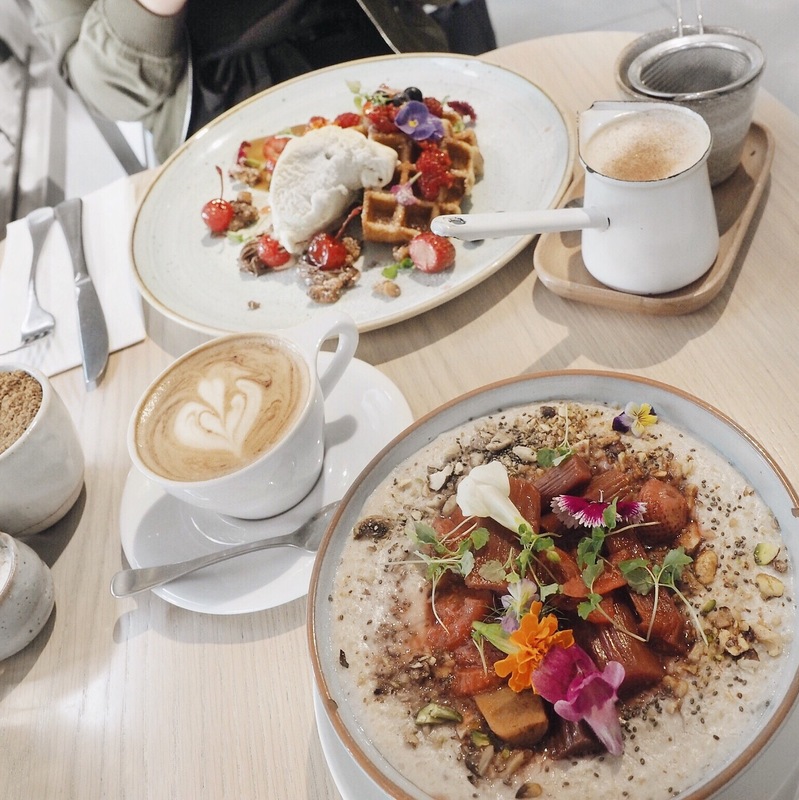 Cost-wise, the Crux & Co isn’t somewhere to go if you are looking for cheap eats but I would suggest it if you are looking for a nicer place to go and are willing to spend a little bit extra. The menu is priced around $15 – $25 and our total in the end came to roughly $45, which is relatively average for brunch nowadays.